Complex passwords are good, as they are very tough for a stranger to guess and hack through your device. But how easy is that to type in your iPhone? Moreover, 4 digit passcode (the standard passcode) will be automatically submitted upon correct entry. In the case of complex passcodes, you will have to tap “Done” after typing it (tap “OK” in older iOS). Of course, it’s not a big deal but certainly involves a bit of tap. Do you agree? 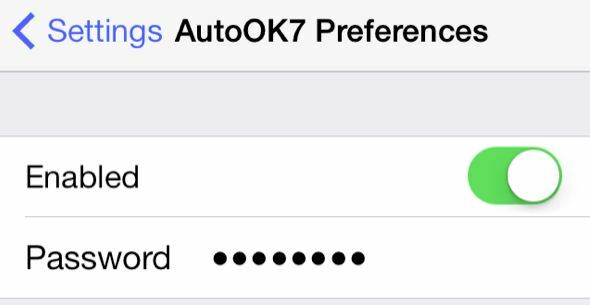 AutoOK7, a jailbreak tweak with a support for iOS7 will automatically submit complex passcodes after typing it. It means, it eliminates the need to tap ‘Done’ after entering the passcode. Installing the tweak is quite easy, pay $0.99 and download it from BigBoss repo of Cydia. Once installed, the app will add a new preference panel in the stock settings – where you can enable or disable the tweak. One of our reader “Santu” asked me why did the developer name the tweak as “AutoOK”, instead “AutoDone” would have been an ideal name (as you need to tap “Done” after typing complex passcodes)? Well, Santu! The earlier version of firmwares had OK button next to the complex passcode entry box and the users will have to tap “OK” that time. But in iOS7, it is replaced with “Done”.